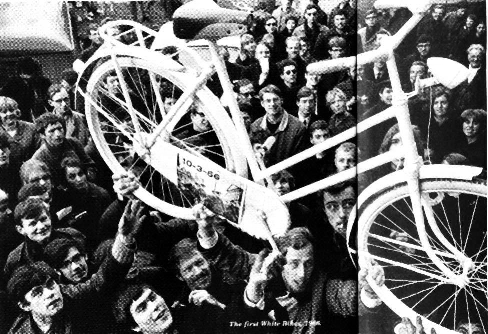 The first well documented community bike program implementation was in Amsterdam, Netherlands in the 1960’s. The program was conceived by Luud Schimmelpennink, a member of the anarchy group, “Provo”. French port La Rochelle, France’s first – and, for many decades, only – city committed to environmentally progressive planning, pioneered such experiments with its yellow bike rental program in 1974. Despite La Rochelle’s success (its project continues to operate to this day), no other cities followed suit. 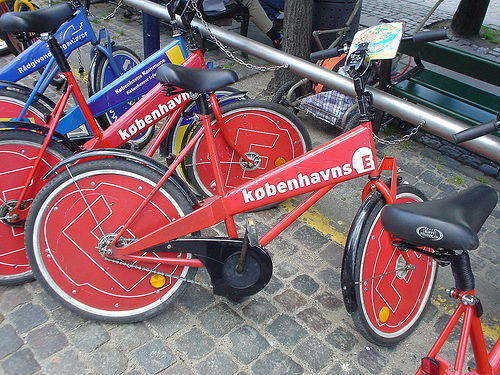 A full two decades later, Copenhagen’s free bycyklen bike-loan program, begun in 1995, served as the true European catalyst, inspiring several imitators, including Helsinki (2000) and the Danish town Arhus (2005). Aveiro in Portugal launched a free bike-loan program in 2001 and the French city of Angers opened its VéloCité system in 2004. In Switzerland, where such efforts have been initiated and operated by independent, non-profit associations rather than municipalities, bike-sharing has taken a somewhat different form. The non-profit association Genève Roule has run a free-bike program since 1997, for example, and similar initiatives exist in other cities across the Confederation. Germany’s national railway has operated the Call-a-Bike rental service since 2001, now in Berlin, Frankfurt, Munich, Cologne, Stuttgart, and Karlsruhe, and the Dutch national railway offers a similar rental service. In parallel to Deutsche Bähn’s service, a small firm called Nexbike is testing bike rental initiatives in several German cities. Across the Channel, Oybike has mounted a similar initiative in London. But the real impetus for the recent spread of bike loan programs in Europe was more of a private sector scramble for advertising Euros. Two firms battle each other for the spoils of this lucrative European market: Clear Channel, the largest outdoor advertising corporation in the world, and its leading competitor, the French company JCDecaux (which prefers to call itself a provider of “urban furniture,” and is best known for the sleek, stylish, coin-operated, self-cleaning public toilet units it maintains on Paris’s streets). Locked in a perennial contest for municipal advertising contracts, these companies sought to sweeten their respective offers in recent years by bundling them with bike-sharing systems. ted unprecede nted numbers of users (10 % of the city’s inhabitants are subscribed today). Lyon’s success caught city planners’ attention across Europe: the following year, JCDecaux installed the Cyclocity system in Brussels and Vél’Hello in Aix-en-Provence, Clear Channel set up Stockholm’s Citybike system, the Spanish city of Burgos put in place its own free BiciBur program, and in 2007 Orléans awarded a concession for Vélo+ to the French state railway SNCF’s subsidiary EFFIA. The key to Vélib’s unexpected success, its unprecedented scale, also came about as something of an accident. When Paris Mayor Bertrand Delanoë decided to implement a system in Paris in the fall of 2006, he clearly had something like Lyon’s model in mind. His initial invitation for bids called for 6,000 bikes and 600 pick-up and drop-off points – had it been left at that, it would still have been the biggest in Europe, although on the same order of magnitude as Lyon’s network. Paris’s bicycle rental scheme that has transformed travel in the city has run into problems just 18 months after its successful launch Over half the original fleet of 15,000 specially made bicycles have disappeared, presumed stolen. They have been used 42 million times since their introduction but vandalism and theft are taking their toll. The company which runs the scheme, JCDecaux, says it can no longer afford to operate the city-wide network. Championed by Paris Mayor Bertrand Delanoe, the bikes were part of an attempt to “green” the capital. Parisians took to them enthusiastically. 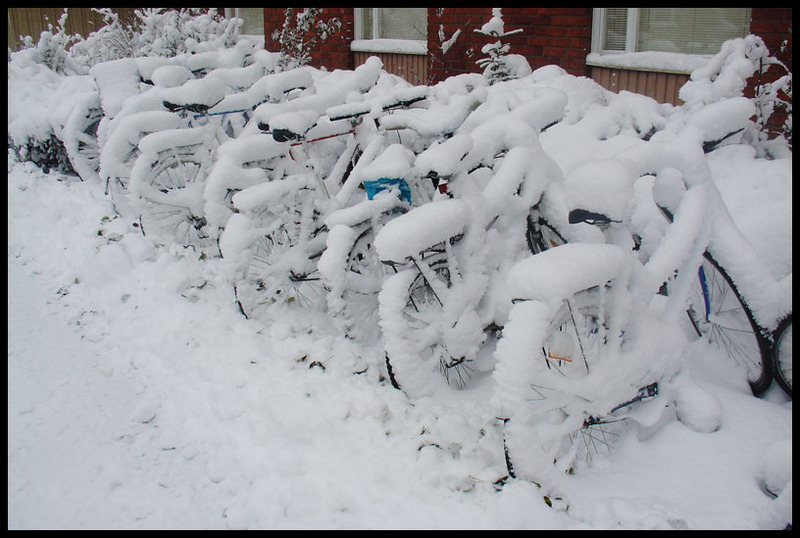 But the bikes have suffered more than anticipated, company officials have said. Hung from lamp posts, dumped in the River Seine, torched and broken into pieces, maintaining the network is proving expensive. Some have turned up in eastern Europe and Africa, according to press reports. 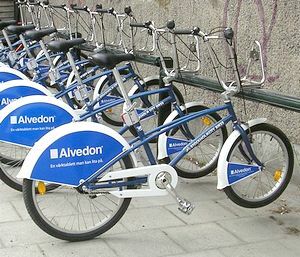 Since the scheme’s launch, nearly all the original bicycles have been replaced at a cost of 400 euros ($519, £351) each. 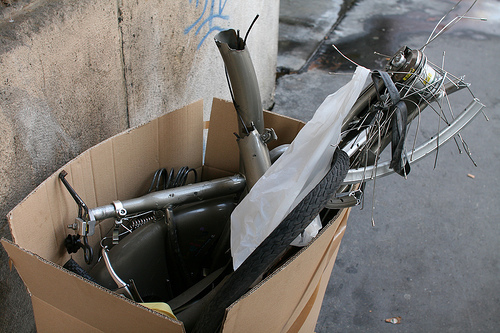 The Velib bikes have also fallen victim to a craze known as “velib extreme”. Various videos have appeared on YouTube showing riders taking the bikes down the steps in Montmartre, into metro stations and being tested on BMX courses. Remi Pheulpin, JCDecaux’s director general, says the current contract is unsustainable. “It’s simple. All the receipts go to the city. All the expenses are ours,” he said. The costs, he said, were “so high that a private business cannot handle it alone, espcially as it’s a problem of public order. 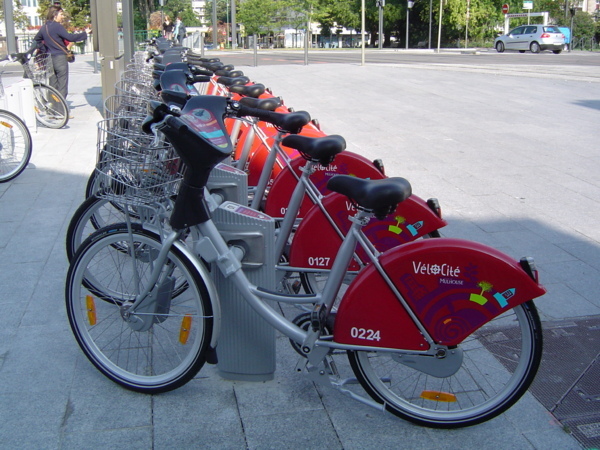 If we want the velib set-up to keep going, we’ll have to change the business model,” he told Le Parisien newspaper. 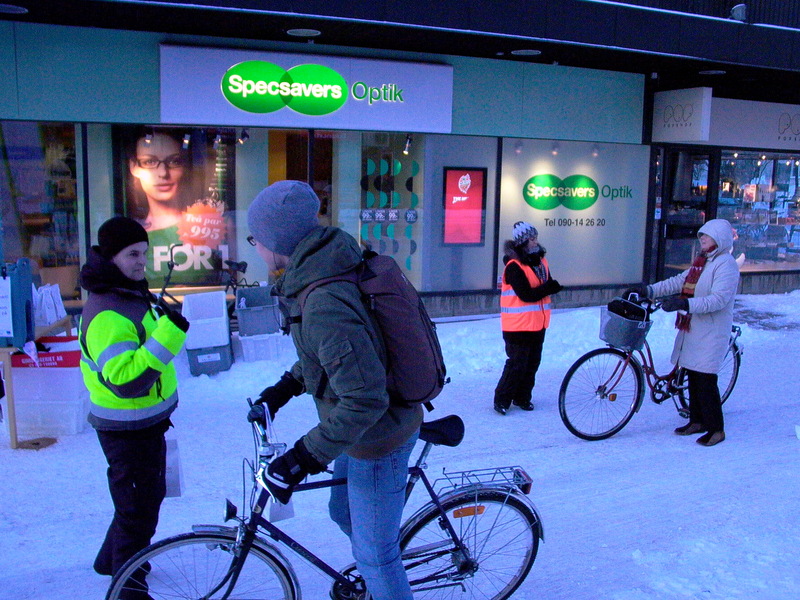 This morning Umeås sustainable travel project group handed out breakfast and hot coffe to sustainable commuters on Kungsgatan this gave me a good chance to study how the cyclist of Umeå deal with the cold weather when cycling. Many of the statements have to do with practical matters that could present design opportunities, given that the group is sustainable travelers by occupation it is no surprize that few of the answers have to du with attitude or plain lazyness, yet personal appearence is a considerable factor. 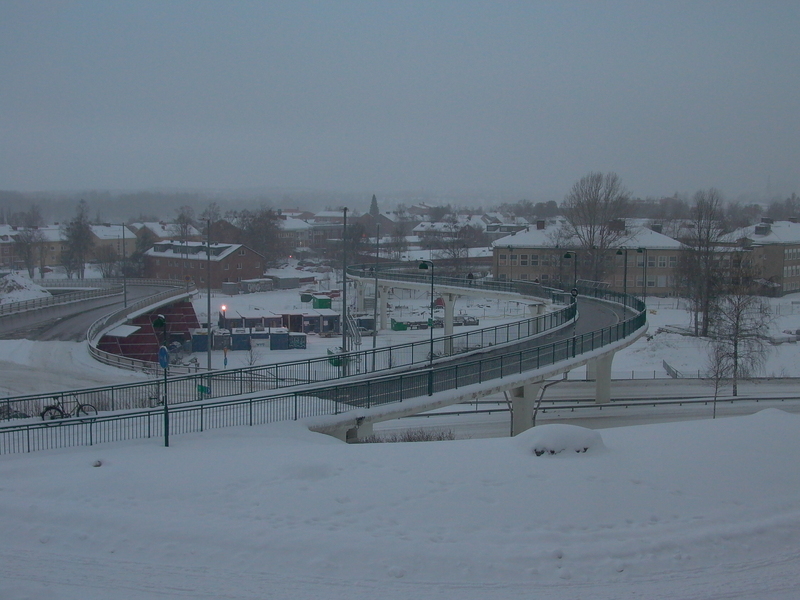 Here is a picture from this morning of the heated Cycle/pedestrian bridge 6000 cyclists crossed here every day in 2007, it looks empty at the picture because I was late today. 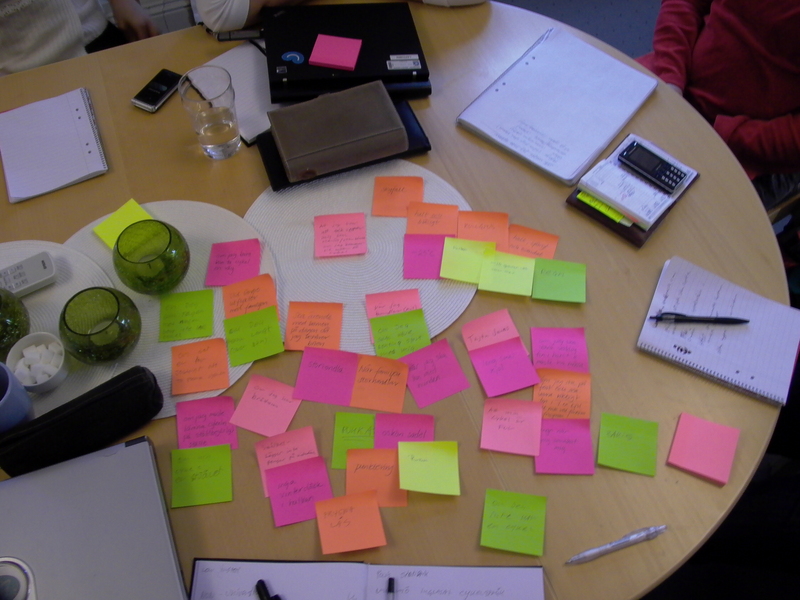 Had an excellent meeting yesterday with Umeås sustainable travel project group (Hållbart resande) who provided a lot of information. 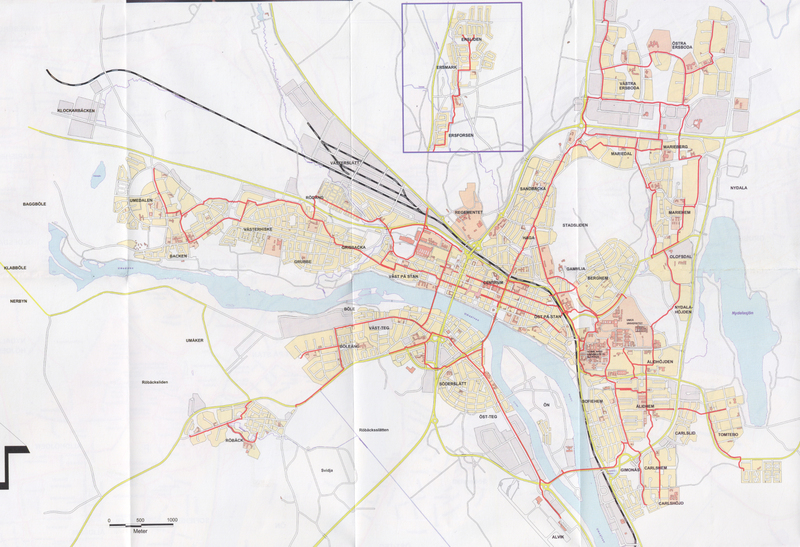 Umeå Municipality has an incredible amount of background information and in-depth surveys on the traffic situation in and around the city.